Many people think that planned giving is a difficult process and only something that wealthy people can do. In reality, planned giving is easy to do and a great opportunity to leave a legacy for future generations. Planned giving, or gift planning, enables individuals to make larger gifts to nonprofits and charities than they normally could make from their income. Depending on the type of gift chosen, an individual may enjoy tax benefits, secure a lifetime income stream and provide additional income for heirs. These gifts, while planned now, help ensure that the voice of WMPG Community Radio will be alive and well for years to come. There are a number of ways you can support the future of WMPG with a planned gift. 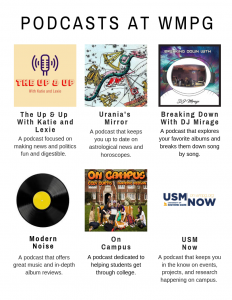 WMPG is part of the University of Southern Maine and your planned giving can be directed towards WMPG through USM. More information can be found at the USM Planned Giving page. It is important to consult your attorney or estate specialist when making planned giving decisions. Should you have questions regarding WMPG’s planned giving options or wish to talk with someone at the station, please call Jim Rand, WMPG Station Manager at 207-780-4424 or e-mail stationmanager@wmpg.org. We are honored to accept your planned gift and would like to know more about your future wishes, as they involve WMPG. If you have already included WMPG in your estate plans, please let us know. We would enjoy the opportunity to thank you and would like to make sure your intentions are carried out properly.